Built on an artificial island, resembeling a ship's sail, the 321 meters tall hotel is an amazing sight. 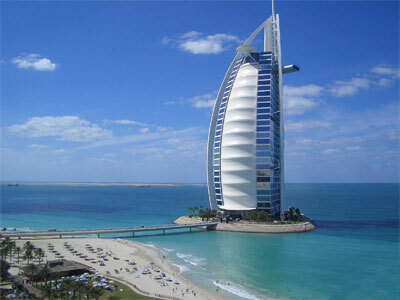 This "seven star" luxury hotel is the fourth tallest hotel in the world, and it is the icon of Dubai. It was designed by the architect Tom Wright. The hotel was officially opened in 1999. It has 205 extravagant rooms and it's decorations cost a fortune alone.